Spark of Life focuses on specialized CBD remedies made exclusively from Golden Harvest Cannabinoids using organically grown hemp and a revolutionary extraction process. This Full-Spectrum blend delivers cannabinoids in levels not found in any other CBD product. Contains no THC! Bottle contains THC-V. Do not confuse this with THC. They are not the same. THC-V is probably the most sought-after cannabinoid on earth. THC-V is an appetite suppressant. In contrast to THC, THCV may dull the appetite. This may be good for consumers focused on weight loss, but THC-V should be avoided by patients treating appetite loss or anorexia. THC-V may help with diabetes. Research shows promise in THCV’s ability to regulate blood sugar levels and reduce insulin resistance. THC-V may reduce panic attacks. It appears to curb anxiety attacks in PTSD patients without suppressing emotion. THC-V may help with Alzheimer’s. Tremors, motor control, and brain lesions associated with Alzheimer’s disease appear to be improved by THCV, but research is in progress. THC-V stimulates bone growth. Because it promotes the growth of new bone cells, THCV is being looked at for osteoporosis and other bone-related conditions. Ingredients: MCT Oil, Golden Harvest Cannabinoid Oil. No emulsifiers, glycerin or alcohol. Drop one dropper full (1mL) straight into your mouth or for a tastier option, you can add it to your morning smoothie, juice or even salad dressing! Shake well before use. Purchase this product now and earn 90 Goldbucks! 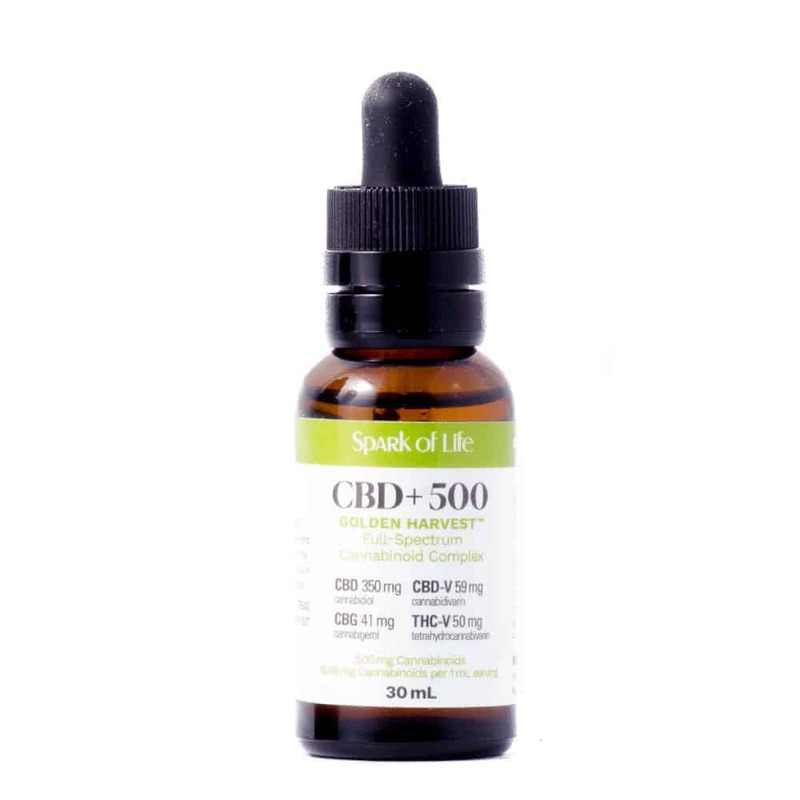 2 reviews for "Spark Of Life – 500mg CBD Tincture"
Wonderful oil tincture. Has nearly no taste at all so you can add it to any food or drink or just take it on it’s own under the tongue. Non psychoactive but effective. I use for chronic migraine and digestive issues. (GERD). Really nice tincture. Definitely helping with degenerative disc pain in upper neck. Prompt delivery to my mailbox as well.